In a rally of many firsts including a left-hand drive vehicle in a foreign country, Paul Pyyvaara and Anthony McLoughlin successfully partnered to finish second outright and second in Group N in last weekend's Chinese National Rally Championship in Long You city. Paul's long time engine builder, Robin Berardo of PerFOURmance Motorsports in Brisbane's Southside, opened the door for Paul and Anthony to compete abroad earlier in the year, however the SARS virus delayed their start until last weekend. Robin has been working with the Chinese Wei Long Motorsports team throughout 2003, assisting them in development and maintenance of their fleet of cars, including three WRX STi version 3 and one Evo 7 Lancer. With the Chinese team well aware that Australia's own Group N Championship is one of the leading Group N competitions in the world, they were keen to see how their local drivers would compare to the standard in Australia. While Paul has not competed since winning the Aussie Car class in the well known Commodore ute in 2000, his past results convinced the team he had what it takes for a successful result, and to assist the Chinese drivers in developing their skills. Similarly, Anthony's vast range of experience assisted the Chinese navigators to improve towards the pace required for top level rallying competition. Two days of testing with the Chinese VW team prior to the event had been planned to allow Paul and Anthony to familiarise themselves with both the car and local conditions, however a delay in the delivery of the team vehicles resulted in only 12km of testing - barely enough time to gain a good feel for the car. 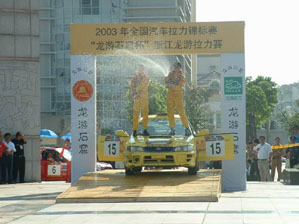 Therefore, the competition vehicle was used for recce - something allowed in China, albeit on road tyres. Friday was the opening ceremony and media day. This was a little different to Australia as it began with a long 160km police escorted convoy through villages to a neighboring city, with anti-lag echoing in the main streets off the surrounding buildings. Now that the lead up was completed it was time for Pyyvaara/McLoughlin to show what they could do. The rally consisted of four separate stages including a super special stage where two cars ran head to head, much like the Langley Park concept in Rally Australia events. Day one was short with two stages, each run twice with only 37km of competitive distance. Day two also consisted of two stages, each run three times with a competitive distance of 100km. With temperatures reaching 38 degrees this was a physically challenging event as well! Fast flowing roads became tight and twisty through villages and the surrounding mountains. A very loose surface provided further challenges in tyre choice and pressures. With a planned cautious start Pyyvaara/McLoughlin increased their speed through the first day. Stages 1 and 3 were the autocross circuit with the 5th quickest time on both runs - the dust from the other car causing a problem as it drifted across the track on the second pass. Stages 2 and 4 again were the same stage and Pyyvaara/McLoughlin were 3rd quickest on the first run and 2nd quickest on the second run, a full 16 seconds faster than on the first pass as confidence was gained. This resulted in 3rd outright position for the day, 7 seconds from 2nd place and 8 seconds from leader Chan Chi Wah - a driver for the Honghe team being the main competition for Pyyvaara. A minor mishap on stage 2 resulted in a broken indicator on the right side of the car - Pyyvaara admitting to turning in too early as if driving a right hand drive car. With six stages on day two, he only needed a few seconds per stage to make up the gap. Day two was another hot and humid day in Long You (37 degrees Celcius) and one of the most difficult days Pyyvaara/McLoughlin had ever experienced in rallying. The humidity and high temperatures meant that drinking plenty was imperative to ensure dehydration would not be a problem. After the final stage Pyyvaara required some time in the car before being able to walk without feeling dizzy. Stage 5 was a mix of reasonably fast flowing stages, the odd few hundred metres through a village and some very tight and twisty corners up in the hills - a real challenge. Unfortunately Pyyvaara had a slow start being 18 seconds off the pace of leading Chinese driver Chan Chi Wah. The second stage saw Pyyvaara a further 10 seconds away, giving the leader a good 40 second buffer. For the second run the Australians decided it was time to commit more, giving them the 2nd quickest time on the first stage, and with a blistering time they were quickest on stage 8. The team was beginning to close the gap. A puncture and loose rear control arm on this stage saw the car a little unstable but the commitment was there. With 26 seconds to make up on the final run of the two stages, Pyyvaara threw caution to the wind and again went quicker, setting the fastest time to eventually finish 9.2 seconds behind the winner. In the final stage, which was fast and flowing, the team was an incredible 13 seconds quicker than their nearest competitor over 14km, but it was not enough. The presence of Australians in rallying in China is sure to increase the level of every aspect of the sport. With a level of presentation equal to that in Australia and a very well organised event which ran on time, rallying in China is certain to grow. As car preparation skills, tuning skills, driving and navigation skills are passed on to the Chinese, we are certain to see a Chinese driver emerge into the world scene in the near future - the enthusiasm and dedication is certainly there. Pyyvaara and McLoughlin wish to thank Wei Long Racing and PerFOURmance Motorsport for this opportunity. A full season is planned for 2004 including driver and navigator training and testing.